Decorate this sweet and salty bacon treat with colorful sprinkles for the holidays or a game day party. Soak wooden skewers in water at least 1 hour, preferably overnight. Preheat oven to 400°F. Line baking pan with aluminum foil and place a baking rack on top. 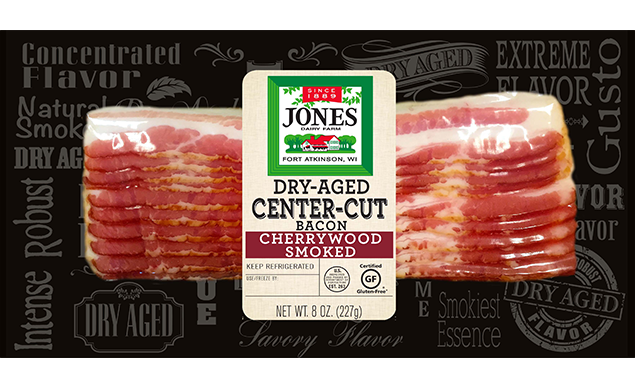 Thread bacon strips, weaving back and forth, onto soaked wooden skewers and place onto pan. Bake until crisp, 20-25 minutes. Drain on paper towels; cool completely. Place each color of candy wafers in a separate bowl with shortening or oil. Cook in microwave in 30 second increments, stirring in between increments until smooth. If coating is too thick, add another teaspoon of coconut oil or shortening and stir. Place chocolate chips and peanut butter chips in separate bowls and melt in microwave, cooking in 30 second increments, stirring until smooth. 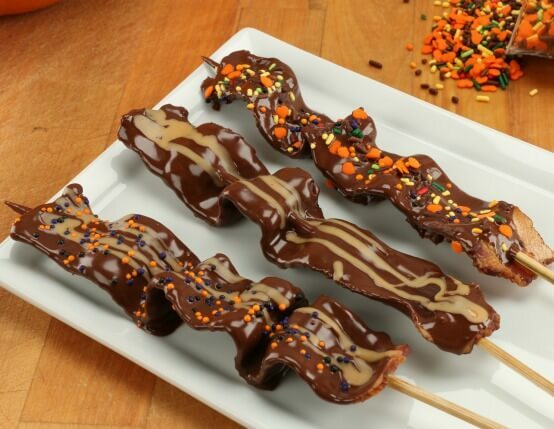 Using pastry brushes, brush both sides of bacon with colored candy coating or chocolate. Sprinkle with desired toppings and drizzle with melted peanut butter chips or additional candy coating as desired. Place on a baking sheet lined with wax paper and refrigerate until set. Store in refrigerator. This recipe can be easily adapted for any holiday or occasion. Simply select candy coating colors and toppings to fit desired occasion. Follow recipe as noted above.